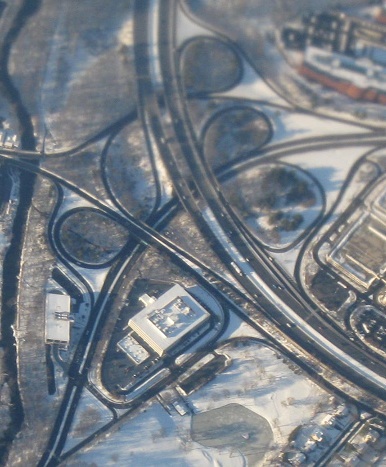 JFK Parkway is an expressway connecting NJ 24 with Livingston. 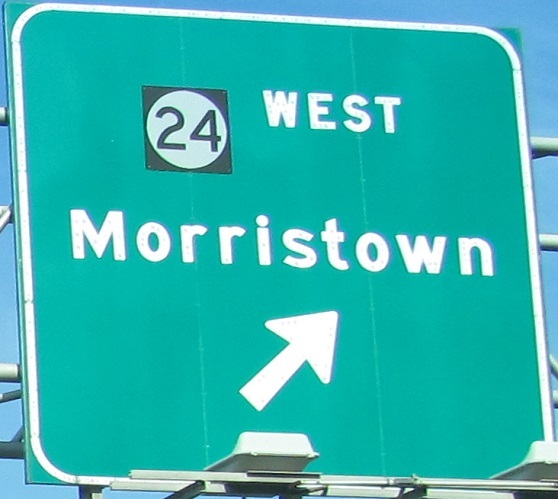 It's never had any planned extensions; it was meant to tie into the end of Livingston Avenue (Spur CR 527 at the time south of East Cedar Street, CR 527 north of there) at Hobart Gap Road, and was built about when NJ 24 was completed between Exit 7 and I-78. According to J.P. Nasiatka, there were a couple of years when JFK Parkway existed and NJ 24 was still entirely a surface road - and the Short Hills Mall was outdoors and tiny. 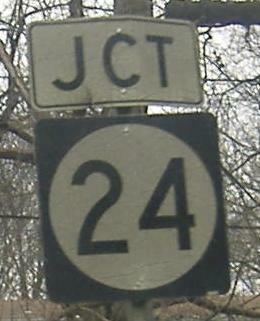 It only had one traffic light instead of four, and JFK met River Road in a traffic light at 24. 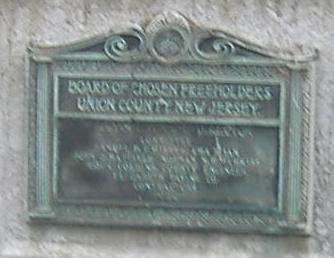 Two old bridges on River Road, Union CR 649, just south of the NJ 24 interchange, with a zoomout on the first one. Heading north on River Road, which continues straight as the ramp to and from EB 24 and 124. JFK Parkway begins at this intersection, which was recently modified to allow for a driveway entrance on the west side, and takes 649 into Essex County. If you're wondering why it's scrunched way over on the sign, all signs referring to JFK PKWY at the interchange once said KENNEDY PKWY. I guess there needed to be disambiguation? North is to the right, maybe a bit toward the top. River Rd. comes in from the bottom and CR 649 transitions to JFK Pkwy. and heads north. 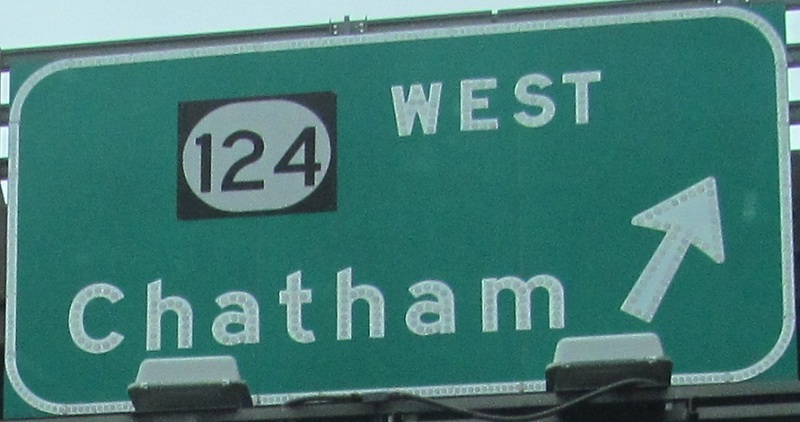 NJ 124 crosses the stream on the left and becomes the NJ 24 frontage roads to the lower right. 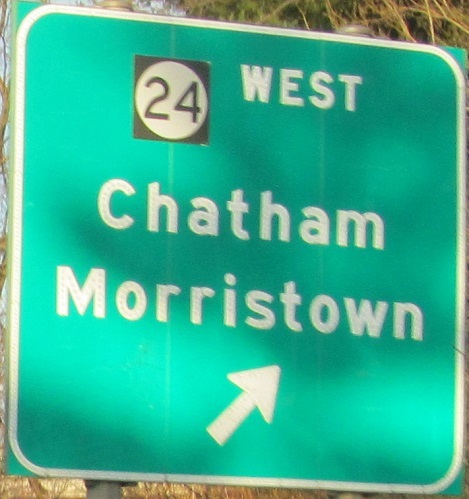 If you took the 124 EAST/River Road/Summit option instead of the TO 24/WEST 124 option, you would come to these signs instead. This is the technical end of JFK Parkway, or more accurately it ends at the next signal south of NJ 24, where River Road comes in from NJ 124 EB. As you can see, I've been through here twice, and like what I took both times. JFK Parkway comes out of River Road where River becomes the ramp to/from EB NJ 124 and itself. 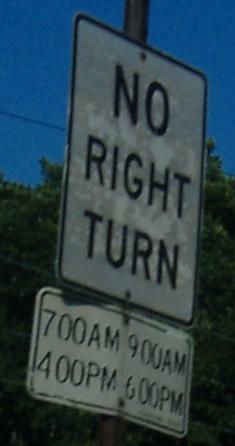 These are the first three (no, there aren't six, you just have bad vision) signs you see that are actually on JFK. If you couldn't tell from its odd placement, JFK was once Kennedy, and in particular the first BGS shows you this on a bright day (it didn't favor my camera, though). Just a bit farther north, in the middle of the Short Hills Mall. Three lanes are useful for queuing traffic in three short spaces between traffic lights; I won't attempt to figure out all the various movements that take place between JFK and private property. 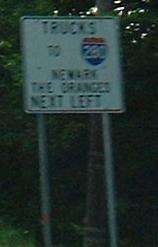 The progression of signs that ultimately direct you to Eisenhower Parkway. I've expounded at length on this on both the NJ 24 and I-280 pages, so go to those - basically, the Triborough Road, aka Eisenhower, was supposed to be the truck route. 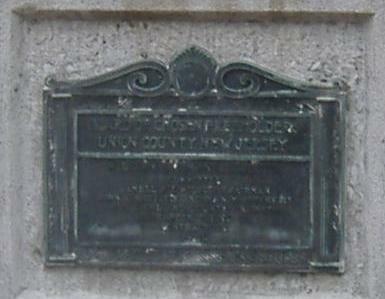 The first sign, on the Parsonage Hill Road overpass (the only interchange, as opposed to intersection, on the Parkway) is clearly nonreflective, as you can see the few shiny patches that are left, and the shield is useless at night. 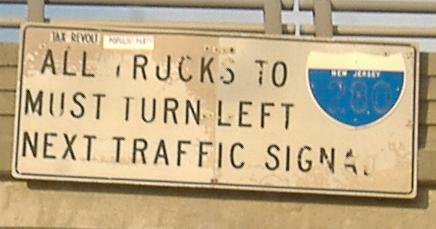 The trucks to 280 sign is just poorly done, but I think the recent addition of Truck I-280 is cool - since it's carrying trucks from both directions of 24 to both directions of 280, why bother giving it a direction? 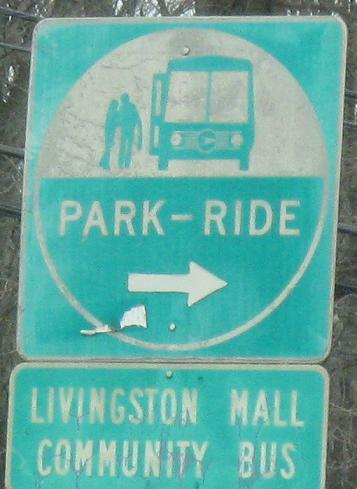 Livingston Ave. ends (SB) and JFK Parkway begins, at Hobart Gap Rd. (CR 608). When it existed, Spur CR 527 turned left here. 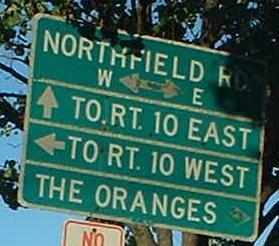 Before JFK Parkway was constructed, Northfield Rd. (the next intersection to the north) turned onto what's now Livingston Ave. and bore right here at what was then closer to a Y intersection. 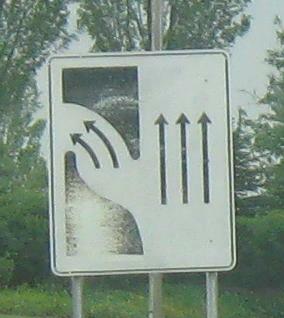 You know this sign is old by looking at the bus. Peeling LWS and an old LGS, NB at Northfield Rd. 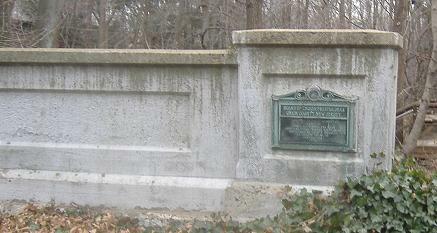 (CR 508). 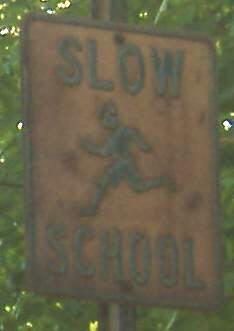 NB and SB respectively on Livingston Avenue, the SLOW SCHOOL signs are rusted red through their paint. At this street corner, even the pedestrian sign can be old. 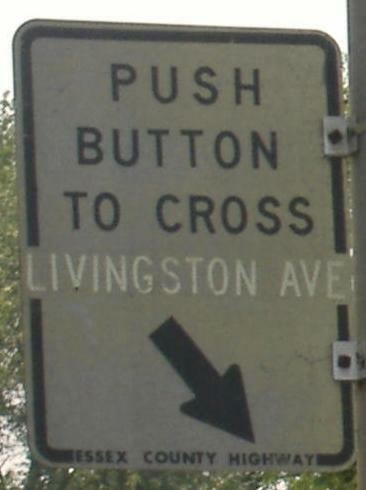 In fact, it's so old that it doesn't give the street as "S. Livingston Ave." - apparently there was only one embossed street blade sign left in 2008 as well that failed to make the distinction. In this case, it may have been based on the amount of room on the sign, though.